Yeah so I have 2 wireless Routers with one Comcast Modem. I'm pretty much a Novice at this but I know I can learn everything pretty easy. My problem is too many people use the internet at the time like constant streaming and stuff and I just want to play a game of FIFA without lag. I can set up a second router to have my Xbox connected to it only but I want to do this without having to lose connection speeds that the wireless router offers. I've heard of hubs and network switches but I don't know which one to buy. Any solutions?? My main concern is not losing that connection speed by having two Routers so I know connecting one router to the other is useless. 1. Decide which router will function as a primary router: Out of the two routers you have, select one as primary router usually the one which is new and fully featured one. Place both the routers near your computer to configure. 2. Configure your primary router: Connect your main router to your Comcast modem and then connect it to your computer using an ethernet cable. Now configure this router as usual. If you want a LAN to LAN connection you can use a default DHCP setting but in case you want a LAN to WAN connection set your DHCP to give signals between 192.168.1.2 and 192.168.1.50. Once the configuration is finished disconnect your primary router from your computer. 3. Configure your Second router: Connect your second router to the computer. 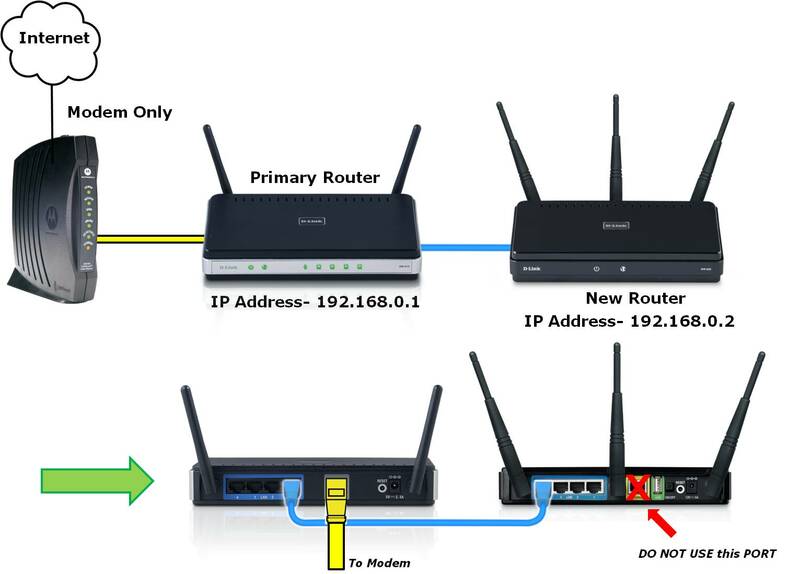 In case of a LAN to LAN connection, change the IP address of your router matching the primary one, except increase the last digit by one. In case of LAN to WAN connection increase the second last digit of IP address by one. 4. Configure the DHCP on the secondary router: If you are using a LAN to LAN connection, disable the DHCP services on your secondary router. For LAN to WAN connection, configure your DHCP to give addresses between 192.168.2.2 and 192.168.2.50. 5. Change the channels: If both your routers are wireless, you need to manually change their channels in order to avoid interference in the network. Change your primary router channel to 1-6 and secondary channel to 11. 6. Connect both your routers: Plug one end of the ethernet cable into the LAN port of secondary router for LAN to LAN connection. For a LAN to WAN connection setup connect the other end of the ethernet cable into WAN port of the secondary router. Hopefully, the above-given steps helped you in resolving the issue. In case you have any query kindly revert back with your issue and I will be glad to reply.